William Wallace Hanshaw10 [William M. Hanshaw11]. Schoolcraft, Solomon C., head-of-household, age 43, born May 1857 in West Virginia; parents born in West Virginia; married 15 years; occupation: farmer; rented farm. Schoolcraft, Polly B., wife, age 34, born Feb 1866 in West Virginia; parents born in West Virginia; married 15 years; 10 children, 9 living. Schoolcraft, Walter W., son, age 23, born Feb 1877 in West Virginia; parents born in West Virginia; occupation: coal miner. Schoolcraft, Emma J., daughter, age 14, born Dec 1885 in West Virginia; parents born in West Virginia; married 0 years; no children. Schoolcraft, James E., son, age 13, born Feb 1887 in West Virginia; parents born in West Virginia. Schoolcraft, Bertha M., daughter, age 11, born Apr 1889 in West Virginia; parents born in West Virginia. Schoolcraft, Sarah E., daughter, age 8, born Mch 1892 in West Virginia; parents born in West Virginia. Schoolcraft, Fanny B., daughter, age 6, born June 1893 in West Virginia; parents born in West Virginia. Schoolcraft, Lula A., daughter, age 5, born Nov 1894 in West Virginia; parents born in West Virginia. Schoolcraft, Albert, son, age 4, born May 1896 in West Virginia; parents born in West Virginia. Schoolcraft, Robert L., son, age 1, born Aug 1898 in West Virginia; parents born in West Virginia. Schoolcraft, (not christened), daughter, age 0 months, born May 1900 in West Virginia; parents born in West Virginia. Hanshaw, William W., son-in-law, age 19, born Dec 1880 in West Virginia; parents born in West Virginia; married 1 year; occupation: laborer (farm). Hanshaw, Evert L., grandson, age 9, born in West Virginia; parents born in West Virginia; attended school. Hanshaw, Howard J., grandson, age 7, born in West Virginia; parents born in West Virginia; attended school. Robinson, John V., head-of-household, age 35, born in West Virginia; parents born in West Virginia; rented home; occupation: painter, house painting. Robinson, Emma J., wife, age 35, born in West Virginia; parents born in West Virginia; cannot read or write. Hanshaw, Everett L. [or S. - unclear], step-son, age 18, born in West Virginia; parents born in West Virginia; occupation: laborer, naval plant. Hanshaw, James H., step-son, age 17, born in Texas; parents born in West Virginia; occupation: laborer, grocery store. Hanshaw, Gladys H., step-daughter, age 13, born in West Virginia; parents born in West Virginia. Robinson, John V., head-of-household, age 45, born in West Virginia; parents born in West Virginia; first married at age 25; rented home ($20 rent); radio in home; occupation: painter, odd jobs; not a war veteran. Robinson, Emma J., wife, age 45, born in West Virginia; parents born in West Virginia; first married at age 25. Martin, Gladys H., daughter, age 24, born in West Virginia; parents born in West Virginia; married, first married at age 15; occupation: cook, restaurant. Martin, Elizabeth M., granddaughter, age 7, born in West Virginia; parents born in West Virginia; attended school. Martin, Ruth M., granddaughter, age 3 years 7 months, born in West Virginia; parents born in West Virginia. John Robinson died Nov 5 1932;16 Emma remarried to James Edgar Mitchell, Dec 15 1933.16 Emma died Jan 10 1937, Charleston, Kanawha County, West Virginia; buried Spring Hill Cemetery, Charleston, West Virginia.16 Emma's obituary was published in the "Charleston Daily Mail" (Charleston, West Virginia) on Monday evening, January 11, 193721 (see scan below). Hanshaw George, meat cutter J E Hanshaw, res Bigley av. Hanshaw J Edward, meats 102 Charleston, h 707 Bigley av. Hanshaw Wm M, meat cutter J E Hanshaw, h 301 Bibby. Hanshaw George W, com trav Sulzberger & Sons Co, h Chanlers Branch. Hanshaw James E (Augusta R) (Hanshaw Bros), h 110 Charleston. Hanshaw Wm M (Anna) (Hanshaw Bros), h 414 Elm. Hanshaw Bros (J Edward and Wm M), meats 110 Charleston. Hanshaw George W (Minnie), com trav Sulzberger & Sons Co, h 533 Wyoming. Hanshaw J Edward (Augusta), (Hanshaw Bros), h 110 Charleston. Hanshaw Wm M (Annie), Hanshaw Bros, h 414A Elm, Glenwood, W C.
Hanshaw, W.W., head-of-household, age 37, born in West Virginia; parents born in West Virginia; owned home (mortgaged); occupation: butcher, own shop. Hanshaw, Anna, wife, age 25, born in West Virginia; parents born in West Virginia. Hanshaw, Wm, son, age 8, born in West Virginia; parents born in West Virginia; attended school. Hanshaw, Woodroe, son, age 6, born in West Virginia; parents born in West Virginia; attended school. Hanshaw, Virginia, daughter, age 3 years 1 month, born in West Virginia; parents born in West Virginia. Hanshaw, Sybil, daughter, age 6 months, born in West Virginia; parents born in West Virginia. Morris, A.C., boarder, male, age 41, born in Ohio; parents born in Ohio; single; occupation: carpenter, house. Hanshaw, William, head-of-household, age 47, born in West Virginia; father born in West Virginia; mother born in Texas; first married at age 28; owned home ($4000 value); no radio in home; occupation: salesman, automobile; not a war veteran. Hanshaw, Anna, wife, age 37, born in West Virginia; parents born in West Virginia; first married at age 18. Hanshaw, William Jr., son, age 18, born in West Virginia; parents born in West Virginia; attended school. Hanshaw, Woodrow, son, age 16, born in West Virginia; parents born in West Virginia; attended school. Hanshaw, Virginia, daughter, age 13, born in West Virginia; parents born in West Virginia; attended school. Hanshaw, Sybil, daughter, age 10, born in West Virginia; parents born in West Virginia; attended school. Hanshaw, Paul, son, age 9, born in West Virginia; parents born in West Virginia; attended school. Hanshaw, Janet R., daughter, age 7, born in West Virginia; parents born in West Virginia; attended school. Hanshaw, Robert, son, age 1 year ? months [unclear], born in West Virginia; parents born in West Virginia. 1920 census, 6th Ward, Charleston, Kanawha County, West Virginia; roll T625-1958, ED 97, page 5B, line #66, dwelling #99, family #106. Obituary of Howard James Hanshaw. 1920 census, Charleston, Kanawha County, West Virginia; roll T625-1958, ED 114, page 8B, line #94, dwelling #171, family #186. 1930 census, 3rd Ward, Charleston, Kanawha County, West Virginia; roll T626-2537, ED 30, page 14B, line #81, dwelling #313, family #338. Woodrow Wilson Hanshaw birth record. Funeral of Blanche Marie Hanshaw. Death certificate of Blanche Marie Hanshaw. Blanch Meree Hanshaw death certificate. 1900 census, Elk District, Kanawha County, West Virginia; roll T623-1762, ED 49, page 1B, line #60, dwelling #13, family #13. Richmond Arnold Publishing Co., Chicago, ILL. 1911; pg 465. RootsWeb WorldConnect data by Pollee (). 1900 census, Elk District, Kanawha County, West Virginia; roll T623-1762, ED 49, page 1B, line #52, dwelling #12, family #12. 1910 census, Charleston, Kanawha County, West Virginia; roll T624-1684, ED 57, page 11B, line #90, dwelling #151, family #156. 1930 census, 14th Ward, Charleston, Kanawha County, West Virginia; roll T626-2538, ED 49, page 1A, line #31, dwelling #11, family #11. 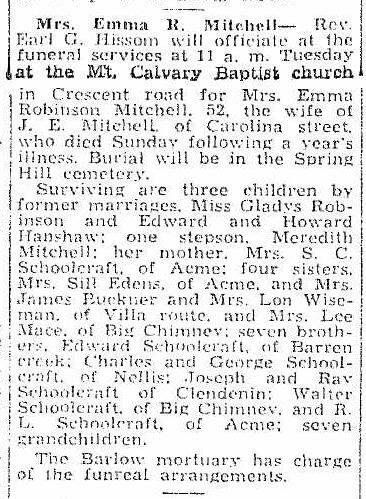 Emma J. Schoolcraft obituary; "Charleston Daily Mail", Jan 11 1937; http://www.ancestry.com.